This is a beautiful, delicious and refreshing drink for these summer days! It has been sooo hot here in Albuquerque! We have made it twice so far, and the first time it was with a little less quality lavender (less blue) and so the drink turned out less blue. The second time we used ultra blue lavender and it turned out pink. To the first one, we just added a few drops of food coloring and that fixed it! Although, the second batch was more satisfyingly naturally pink colored with no added food coloring. Also, the second time we used half lemons half limes, so maybe that would have impacted the color - however, it turned out much sweeter than just the limes too. So, if using lemons, we would watch the sugar ratio a little bit in the future. Our pictures of this drink seem to have disappeared! I guess we will just have to make it again and update the post! 1. In a 2-quart saucepan, combine 2 cups water, the sugar, lavender, and lime zest. Bring to a boil over high heat. Reduce heat to low and simmer, stirring until sugar dissolves. Remove pan from heat and let syrup stand 10 minutes. Strain and discard lavender. 2. In a large pitcher, stir together remaining 4 cups water, syrup, and lime juice. Serve over ice, adding lime slices if desired. It was Alona's mom's birthday last week, and a last minute party was decided upon. We had these cornish hens in the fridge already defrosted, ready for a meal for the week, so we made them for the party. They were fairly easy to put together and tasted great! 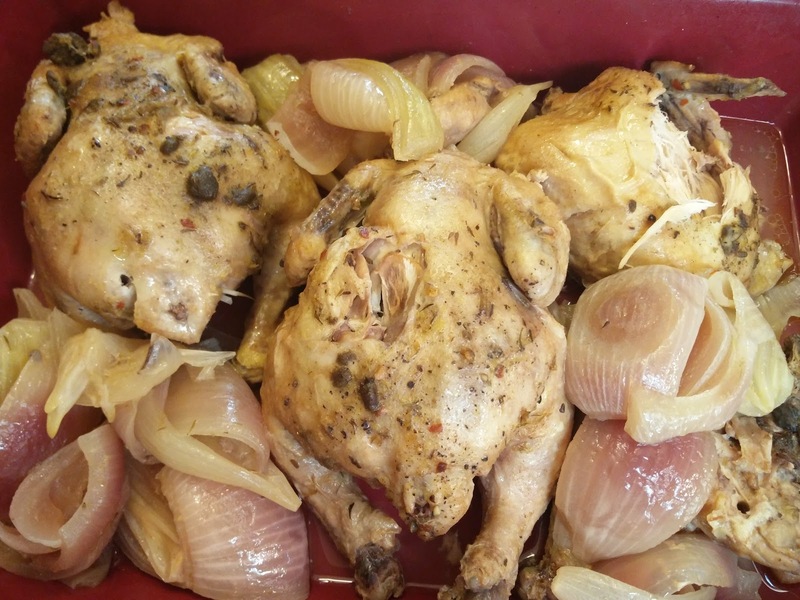 We looked up a few recipes and settled on one main one, but made some modifications such as adding the onions to the bottom of the slow cooker so that the hens didn't just boil in the juices. They turned out delicious and the meat fell away from the bones. Ready to cook - in slow cooker! 1. Mix 1/3 cup lemon juice, melted butter, 1/2 teaspoon thyme, garlic powder, cumin, and red pepper flakes in a bowl. Pour and rub lemon juice mixture over Cornish hens. 2. Mix 1/2 teaspoon thyme, salt, and black pepper in a bowl; sprinkle over Cornish hens. 3. Place the quartered onions on the bottom of the slow cooker. 4. 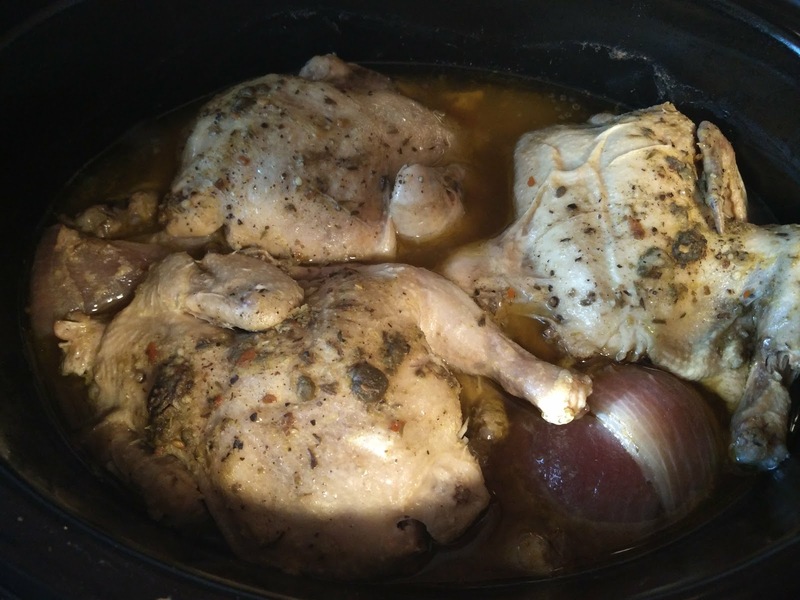 Pour chicken broth and 1/3 cup lemon juice into a slow cooker. 5. Place about 1 tablespoon chilled butter in the cavity of each hen; place hens in the slow cooker. 6. Arrange the remaining butter cubes in the chicken broth mixture. 7. Cook hens in the slow cooker on High for 4 hours or Low for 8 hours. It was quick to throw together and come home to a great meal! If this wasn't for a party, then a rice side would have been really nice. He was having too much fun playing with his cousin to eat food :) Astrid enjoyed pelmeni though.